Saturday, 5th September, 4:30 p.m. at Colette Paris. Crowds of young Parisians and international followers of the Sartorialist are queuing outside the famous concept store to get their copy of THE BOOK signed by Scott Schuman himself. It is almost impossible to enter the store and one could easily assume that some popstar came down to shake hands and give autographs. 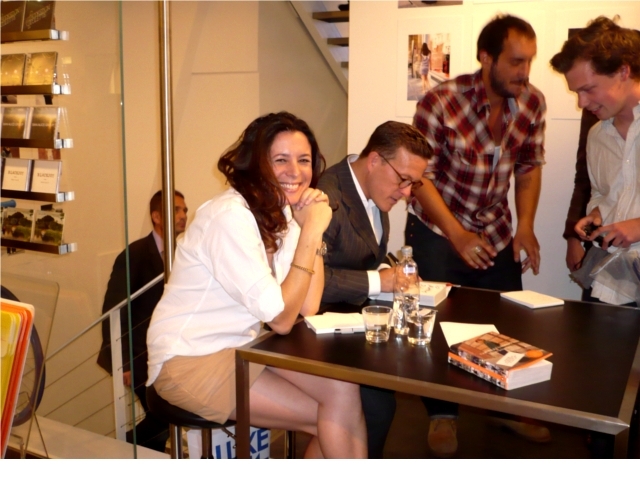 And there, in the middle of flashing cameras, excited fans, the hardworking Colette-staff and next to a very busy Scott, she sits shining and smiling gracefully: GARANCE DORÉ. I had never met her before and believe me: she looks nice on pictures but she is absolutely STUNNING in reality! In a white shirt with rolled-up sleeves, a bandage mini-skirt and matching booties she looked effortlessly chic and cool without screaming for attention. Apart from being one of the most successful and influential fashion bloggers herself, Garance definitely has First-Lady-qualities! I am really waiting for Garances own book to be launched soon! And please don’t make it a limited edition;-)! It is great that you got to see them! She does look great in the picture. I love reading her blog and this pictures really illustrates her style: very effortless, yet still chic.